Double points and double the race time. How exciting. Kvyat slots into P5. The Russian has not scored a point since the summer break. @LD: There were ideas like that going around a few years back. I think it's as unfair as a reversed starting grid. @CrM: Ballast is as artificial as double points or reversed grids. F1 is all about the pinnacle of technology, not adding weight to different cars. @LD: Rules change in F1 all the time, though. Hamilton goes P1 by exactly four tenths. Vettel, meanwhile, leaps into P3. Hamilton went purple in all three sectors on that lap. Very impressive. @LD: Where were you when rules were changed in 2005 to pull back Ferrari?? Rule changes and F1 always go together bud. Seeing a replay of Vergne carrying too much speed into Turn 8 and running across the tarmac. Only four tenths between Maldonado and Ocon, who beat Max Verstappen to the Formula 3 title. It's interesting that Seb mentioned Merc made the year boring... ... RBR were dominant for 4 straight years mate!! @PeteGill: For those of you asking, that's why Bottas couldn't continue in this session. And also why losing bodywork in a race would be a race-ending issue. Lots of work going on in McLaren's garage on Button's car. Only Stevens yet to set a time. @Rohan - At least when RBR were dominating, other drivers could still challenge for the win. Remember the year of 7 Races - 7 Race winners? What do you make of Lewis's hat Nate? Don't you think it makes him look like a bit of a wally? @KeenFan: I don't know. If it was anyone else, no-one would care, but people seem to think if Hamilton wears it he's a bit of a prat. In the day and age of the sheltered PR sportsman/F1 driver, I find it quite refreshing that Hamilton doesn't seem to care what people think about him. A better way would to do what the NFL does. The money from the NFL to the teams is split equally. In F1 that would give smaller teams a much better chance of a good showing, making it much more interesting, while the big teams would still have a sponsorship advantage. Vettel puts his hand up to Magnussen as he comes up to the slow McLaren at Turn 8. Magnussen has none of it and refuses to yield through the corner. Vettel has his old Red Bull helmet on today, the blue and silver lid he wore during his days at Sauber. It says 'Danke' on the top. This will be an emotional farewell for Vettel at the track where he claimed his first world title with Red Bull. Rosberg's latest time puts him P1, one tenth quicker than Hamilton. Going to be interesting to see the rules on track limits at the penultimate corner. Toro Rosso doing its usual trick of showing some great pace on Friday. Hulkenberg slots into seventh with his latest run. He's half a second up on Perez. @DonovanKimiFan, Remember 9 wins in 9 races to finish off 2013?? Remember Brawn in 2009 and Ferrari in 2004, or even Williams in 92 or Mclaren in 88.. The point is, eventually the others catch up, and even with teams being limited on what they can develop, I don't think mercs will have another 2014 next year. @Me: He had an issue on his car after just one installation lap and has not emerged from the garage yet. Magnussen is getting a new wing on his car. Looks like it's another 2015-spec wing, the one designed by ex-Red Bull guru Peter Prodromou. 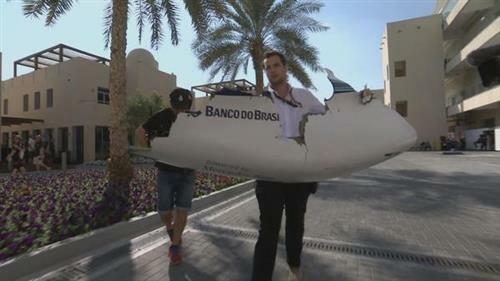 And unsurprisingly it looks a lot like a Red Bull wing. Hulkenberg reports a lot of improvement on the second run on the soft tyres as the track gets more rubbered in. Replays show Ocon missing the apex at Turn 12.